It's just not fair I tell you! Lent begins on Wednesday February 13th. My birthday is Friday the 15th! I ain't afraid to say it, I will hit double nickels! I just don't feel that old! Maybe because it really isn't that old?? 55 is the new 30?? Anyway, what a week right? and passed away on the 18th. So, this year I had high hopes of partying like a rock star. partying until after 9:00 pm none the less! Now, this year Lent falls just days before my birthday! Maybe I'll just give up swearing for Lent? I don't swear a lot but, when I do, well it's pretty saucy! One thing I know I won't be giving up is decorating! at an after Christmas clearance. in the corner of the dining room. I had saved out some Christmas beaded garland when we packed it all away last month. Some Mardi Gras necklaces and masks from the Dollar Tree filled it all in. It's a prelit tree with clear lights and it really lights up the corner! I had originally bought it thinking I'd decorate it for Halloween but I think it works for Mardi Gras too, don't you? I really should give up something fattening for Lent. Chocolates or bread? Naw, dang it! I'm giving up swearing! What about you? Are you giving up anything until Easter? 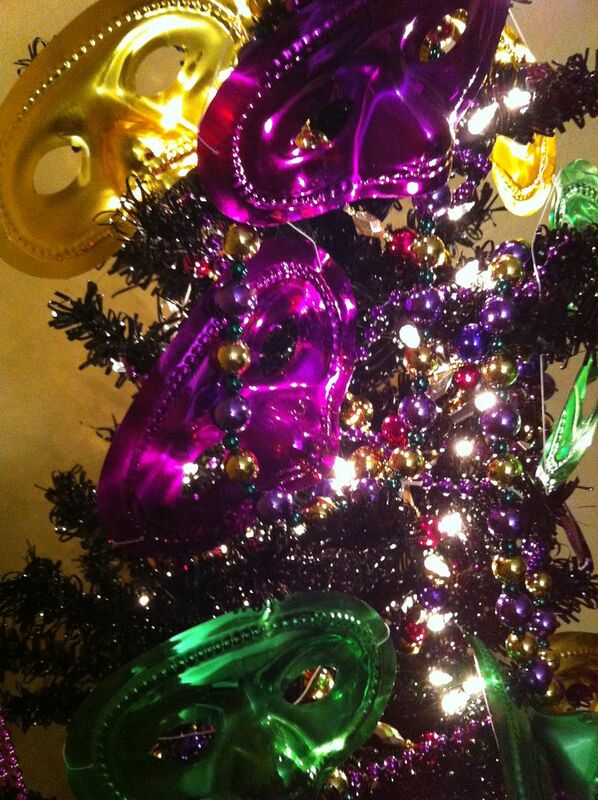 Love your Mardi Gras tree! I hate when all the holidays come so close together! But I'm going to enjoy it all or at least try! Love your tree, so colorful!! 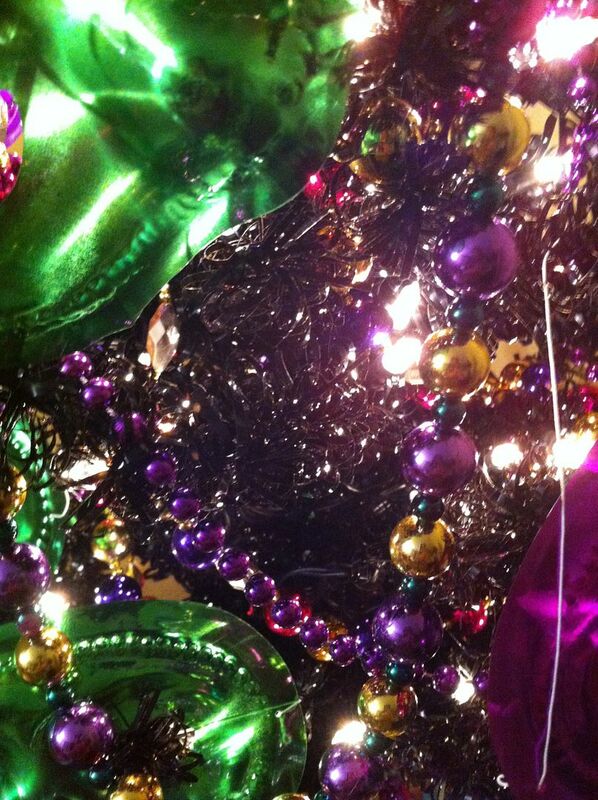 Love your tree, Kathe :) I have never celebrated Mardi Gras ..... it's on my list of things to do "one day". I still need to think about what I want/should give up! Lol, yes give up swearing and have a blast on your birthday! Your tree is lovely. Your tree is so fun! Now I'm thinking I should have bought that purple tree after Christmas sale! A bit early, but Happy Birthday! 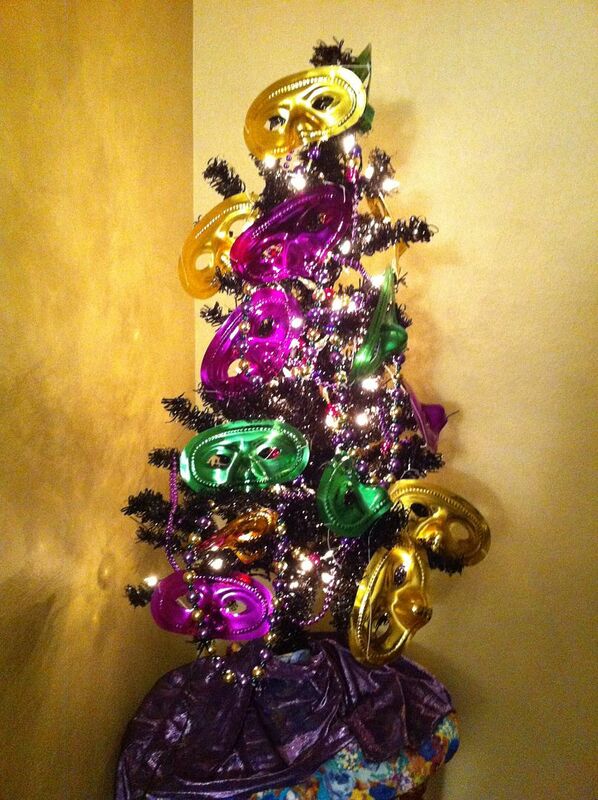 What a great idea - Mardi Gras Tree! Lovely and bright, but does it have to come down on Ash Wednesday, or can it stay until Easter? Have a great day on your birthday too. Met you via the Crafty Blog Stalker get together! It's very cute, Kathe! Wouldn't last at my house as the little guys would promptly decide the masks and beads were for playing dress-up. I enjoyed your playful jest at yourself that you'd party by staying up past 9. I'm only 32 and feel that way most days!! Hope you have a great birthday this upcoming week! What a fun idea! Laissez les bon temps rouler! Kathe, you will just have to party hardy when it's all over! The tree is such a hoot, love it! 55 is definately young. Especially to this gal who is pushing the big '60'. Boy, when I was in hight school that was WAY OLD. Now it seems super young. lol! Have a fab week my friend! Thanks for sharing with SYC. Thanks for sharing at A Humble Creation! Wonderful tree. My maiden name was Lent. So hard to decide what to give up (that would would be a sacrifice). Awe! I hope you have a wonderful birthday Kathe! Thanks for linking up! I love your tree!! Can't wait to see what you do with it for Halloween too! 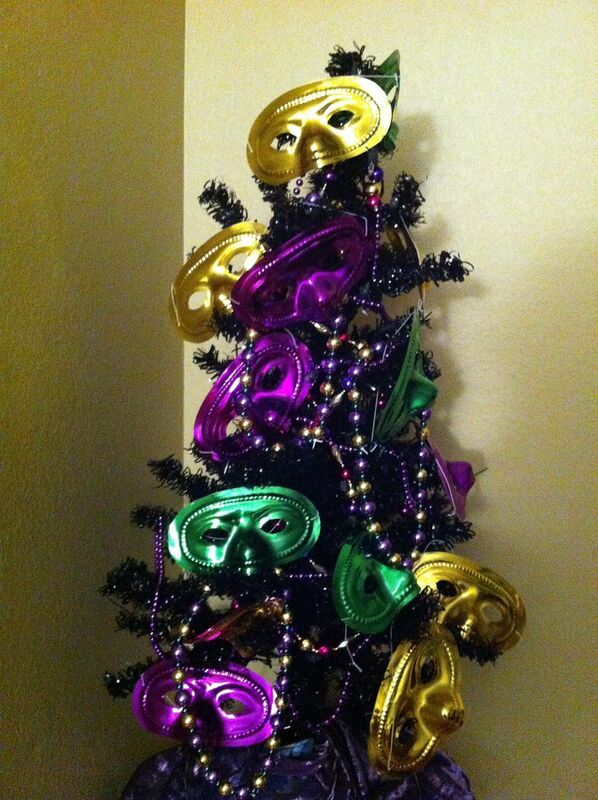 Cute idea, I've never seen a Mardi Gras tree! I love to decorate for Mardi Gras and yes, this year is challenging with Fat Tuesday & Valentine's Day only 2 days apart! My son's birthday is Valentines Day so that gets thrown in my mix too...I have a Mardi Gras centerpiece on the foyer table, Valentine vignette on the bar shelves, and the dining room table is decorated for a Valentine birthday, crazy but lots of fun! Have a great week and Happy Birthday. Oh and yes, 55 is the new 30! Don't worry about not being able to stay up late. I'm in my 30s and I have a hard time staying up late, too! Thanks for linking this up to Frugal Crafty Home! How fun! My son is excited about their Mardi Gras party at school tomorrow! thanks for sharing at Monday Funday! Kathe - first off, if I don't get a chance to say it on your birthday - Happy, Happy Birthday! You are a great woman and you are and will always be young! It is what is in the heart that matters. 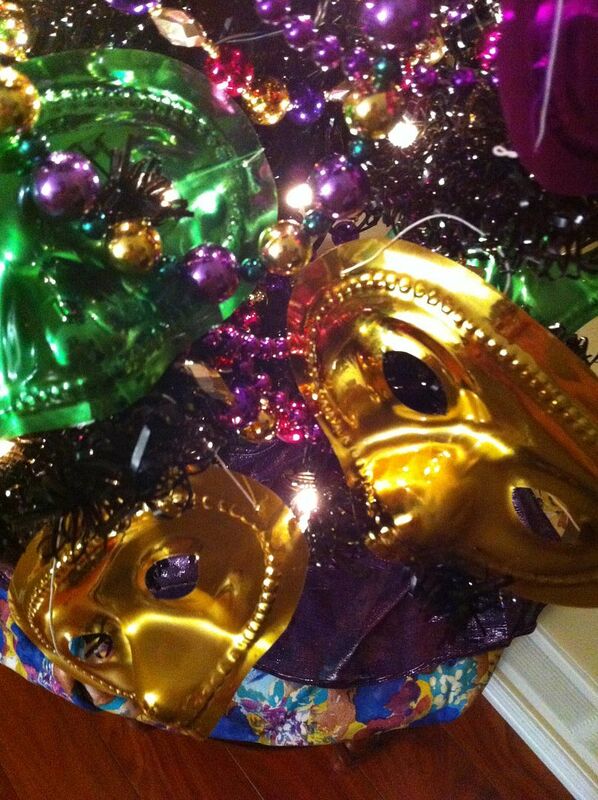 I love the Mardi Gras tree! I wish I would have thought about that. I have a black tree I purchased after halloween and it would have been perfect! Thanks for sharing this fun tree with everyone at the In and Out of the Kitchen party! Can't wait to see what you bring next week! Hey, I'm a new follower! Found you at the Monday meet-up! That's a lovely tree, it's full of color! Don't give up decorating you do such a wonderful job at it! Hope your Birthday is a good one! 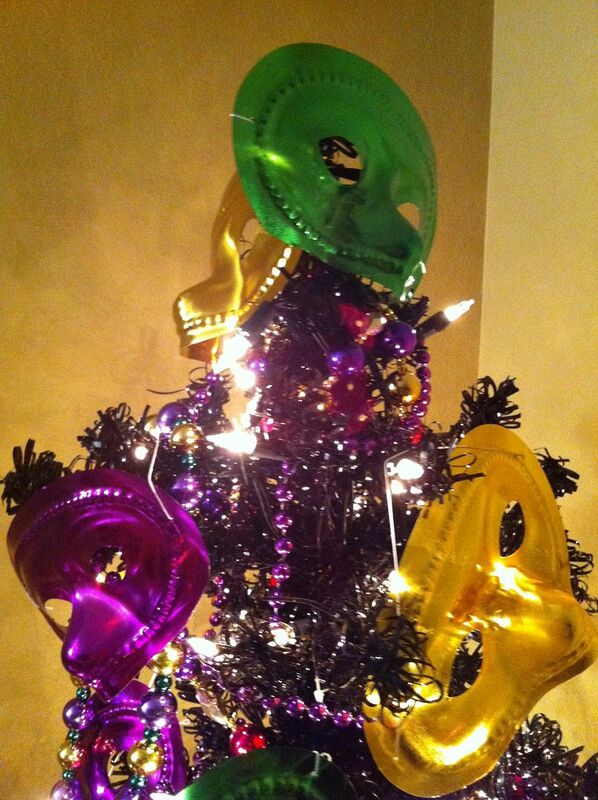 I keep a year-round tree, too - your Mardi Gras tree makes me smile! Thank you so much for sharing this post at my link party. I loved reading it as much as I loved the tree. I LOVE your personality! Good Luck with the swearing! I am two years older than you :-) Happy Birthday, what a busy week you have! 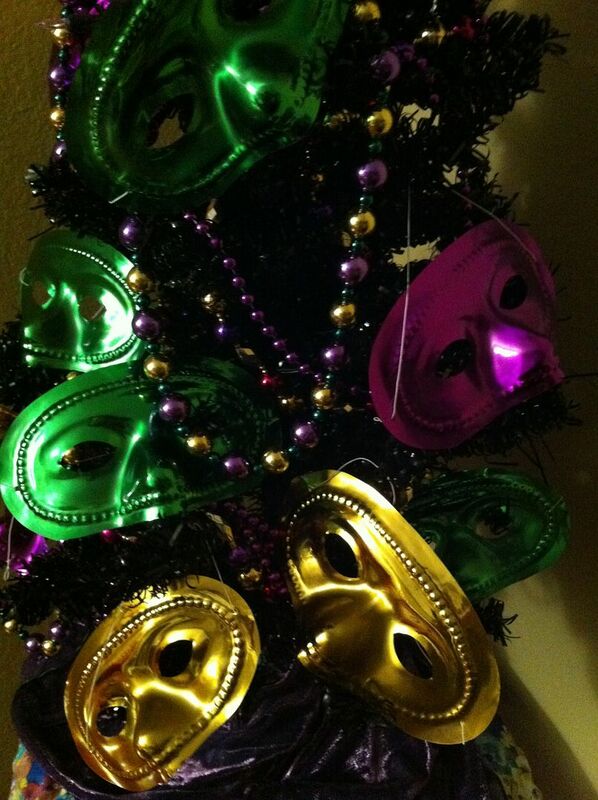 Kathe, Thanks so much for sharing your beautiful Mardi Gras Tree at Simple & Sweet Fridays. So Pretty!